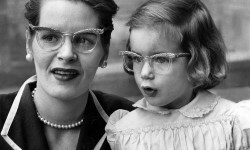 My mother wore her own dark-framed eyeglasses (which were a bit scary to me) at all times. She first got glasses as a teenager, after struggling to see in school, seated far back in the classroom behind a tall boy who blocked her view. She was determined that if I showed signs that I couldn’t see, she would put me in glasses right away — that was all she knew to do for me. She didn’t see my extreme anxiety, or chose not to. She took me to the eye doctor a few times a year from age 5 on, which usually resulted in my getting stronger glasses. My mother often worried about “Nancy’s bad eyes” when I was growing up. Even now this phrase makes my heart sink, and I feel defeated and hopeless, as if I was bad. I tried so hard as a child to do everything she asked of me! In a recent session with my EFT coach we did some tapping on this. “Mom says I have bad eyes” went from having a very strong sting for me, to not bothering me much — Mom didn’t know everything! In this tapping round I could feel my anxiety lowering, and I was able to get out of that childish Survival Mode reaction to think more clearly. My mother was right, within her own limited framework — remember, she’d worn glasses most of her life. But that does not have to be MY truth! When I was a child I was in such a state of near-panic so often, I didn’t have the luxury of taking the time to choose my beliefs and responses. Now I do. Another factor here is that my mother saw the daughter she wanted me to be instead of seeing who I really was. Or perhaps she saw me as the young girl she could have been if her life had been different, and saw a chance to relive her own youth through me. It was as if she wanted me to be her clone! She would frequently try to change my mind about what I wanted, urging me toward something she preferred instead. She’d say “Oh Nancy, you don’t feel that way!” which always confused me. How could she know how I felt better than I did? It’s taken me a very long time to accept my mother and what she gave me, without blaming her or complaining. She had a hard life, and did the best for me she could, given what she knew. When I recognize how flawed her thinking was, I feel sorry for her. She was stuck in a box of limitations too. I’m grateful I have more choices today than I did back then. Mom was not the villain, forcing me to wear those thick glasses. She wanted me to see well enough to succeed in school, but didn’t realize what I really needed was calm and quiet, and to be allowed to play. Have you absorbed some family “truth” which isn’t true for you any longer, and might be holding you back? I am finding my own personal truth, and part of that is that my eyes are more than good, they’re wonderful! I am so thankful for my eyesight, and for my insight. Nice blog. I think I can relate few things with mine as well. I’ve been wearing my glasses from my junior high. I got fed-up and did LASIK treatment from an eye center near our place. Now it feels great without the glasses. Yes — wearing glasses makes you need glasses! Maybe I’ll write a blog post with that title. Good work on your part. Previous Previous post: What Causes Tired Eyes? Next Next post: Strained Eyes from Computer Work?